mSpy lets you view a complete log of all incoming and outgoing calls received on a monitored device. The number of calls made. The device number or a contact's name (provided it is saved in the device's address book). Why will you find it useful? Sometimes knowing what your family members or employees are talking about can prevent real trouble. Bullying or leaking company's information are just a few scenarios when this feature comes in handy. 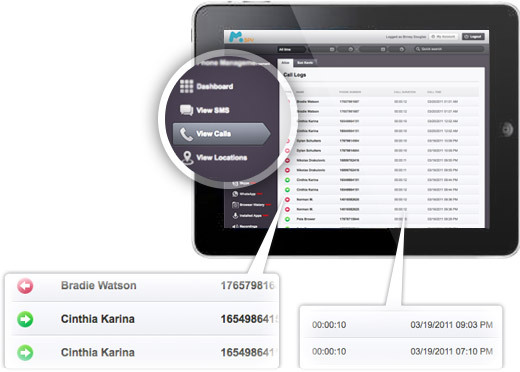 All call logs are neatly organized into your Control Panel and you can access them anytime.